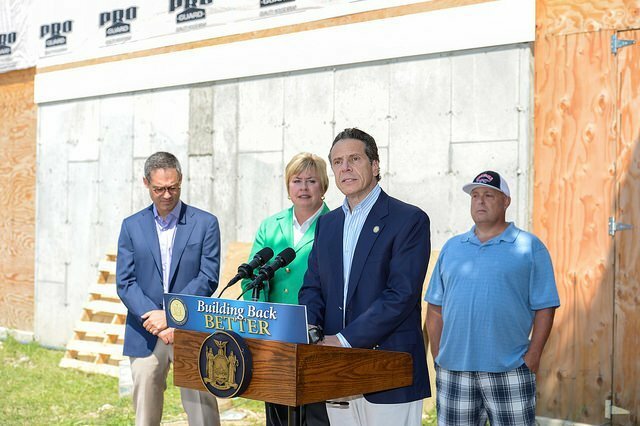 In December 2016, the Governor’s Office of Storm Recovery New York Rising sent all Program applicants a Notice of Deadlines for Your Funding and Completion of Your Construction Project. Governor Cuomo announces expansion of NY Rising Program in 2014. Long Island, NY - February 23rd, 2017 - In December 2016, the Governor’s Office of Storm Recovery (GOSR) New York Rising published on its website, and sent all Program applicants a Notice of Deadlines for Your Funding and Completion of Your Construction Project. The notice outlined to all applicants in the Optional Elevation Program a deadline of a March 1, 2017 to submit any changes or requests for additional funds needed to complete their home elevation. While most of the program participants have already submitted their change orders and are well underway in the construction process, there are still about 150 applicants who have not taken the opportunity to submit a request to increase their elevation award by submitting a 6100 Form. GOSR Executive Director Lisa Bova-Hiatt stated “We are concerned that misinformation regarding the deadline may be causing some homeowners to worry unnecessarily. No one will be terminated from the program or lose their original elevation award if they fail to comply with the March 1 scope of work change deadline. The March 1st NY Rising deadline ends the opportunity for applicants in this program to ask for additional funds that are needed to build out their approved elevation plan. Regardless, those applicants may proceed to continue to elevate their homes using the funds awarded based on original program estimates. NY Rising is committed to serving all applicants who choose to participate in the Optional Elevation Program and encourages anyone who has not submitted a changes to design form (Form 6100) - described on the Storm Recovery website - to reach out to the program as soon as possible. Subject: LongIsland.com - Your Name sent you Article details of "NY RISING Optional Elevation Program Participants Needing Additional Funding: Apply Before March 1st, 2017"